Mondo are proud to present the soundtrack to Fight Club on Vinyl for the first time in over 15 Years. Mondo are proud to present the soundtrack to Fight Club on Vinyl for the first time in over 15 Years. 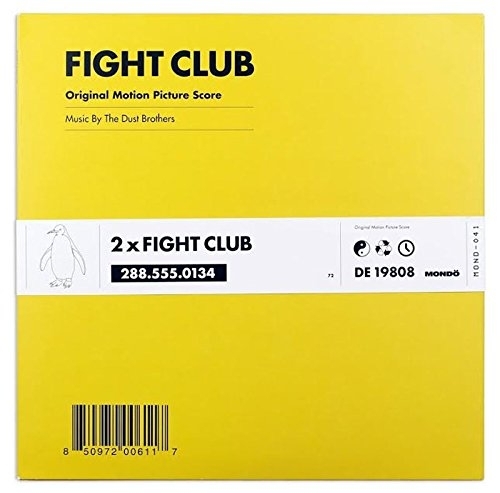 The Dust Brothers only film score to date, Fight Club is arguably one of the most enjoyable soundtrack albums to come out of the 90's and part of that has to do with the fact that it is one of the best sequenced scores of all time. Weaving all of the films cues from the film into 16 songs, the album winds up feeling like the best instrumental Trip-Hop album you've never heard. Buy it, or you will be incomplete. But be warned, this album is not beautiful, clean or perfect. It is not Mint, or even VG+. It is Fair at best. Just like you. You are not your record collection.